I wasn't going to photograph my outfit today, as I knew it was going to be a long library day and that I just wanted to keep it simple. However, when I saw this outfit from Blair, I felt so inspired I had to photograph my outfit. I've always thought of plaid and denim as being super laid-back, but Blair's addition of a bright red blazer made the look so classy, that instead of converse and a cardigan for with my jeans and plaid, I added my red Zara blazer and boots, and a splash of red lipstick. I think this was a perfect laid back but classy look. 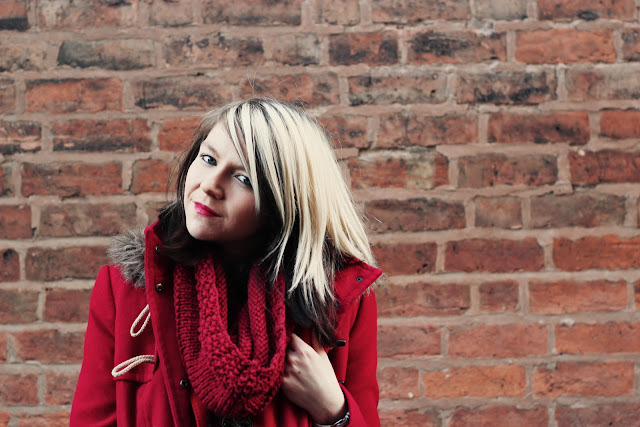 I'd been getting really stuck in a rut of dresses with jumpers and cardigans, thinking they were the only way to wear layers in the cold, but I forgot that I used to always wear a leather jacket or blazer under my coat last year. Realising that I can pop another jacket on instead of a cardigan has really opened my wardrobe up again!! My mum knitted me this snood. Isn't that awesome? She's so clever! I definitely want to learn to knit over Christmas. It's a little weird still being at uni when everyone else has finished. I'm just sticking around for a week to get on with my essays, but it's strange. There is no-one about, Selly Oak is deserted, the library is freezing because they've turned the heating off and the coffee shop has irregular hours. I'm kinda sad, to be honest. I went to bed last night kinda wishing I was at home. But hey, it's only a week and I really hope I get a lot of things done. Today has been one of those "getting things done" days. I sent my Christmas cards to America, posted my housemate Briony the makeup she left here, had passport photos done and had forms sorted and am ready to send off my application for my work experience programme over the summer. Have I told you about this? I decided against the Summer camp, and have applied for a work experience programme in the States for next summer. It may not be directly related to what I want to do, but it will be a great opportunity to spend my summer in the States. I just have a lot of things to sort out before then!! I'm a little bit scared about graduating university in a few month's time, because I have a lot of things I'm going to get on with when I graduate- applying for graduate training schemes and applying for more work experience- but for the first time in my life I don't really have a plan per say. But maybe that's for the best. Maybe I'll just have to see what happens. Well I've got another long library day to look forward to tomorrow. I'm not enjoying it at the moment but I know I'll feel better when my essays are pretty much planned before I go home. I'm probably going to be working quite a bit when I get home, plus obviously spending time with my family, so I want to be as prepared as possible. It's going to be tough going home though, with my grandad being so ill and my grandma being in a nursing home, but I need to be with my family. Have a lovely night, guys! 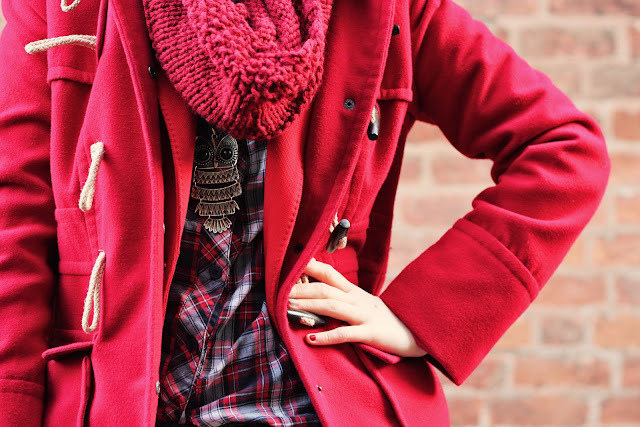 I love red and adore plaid, so I'm all over this outfit. 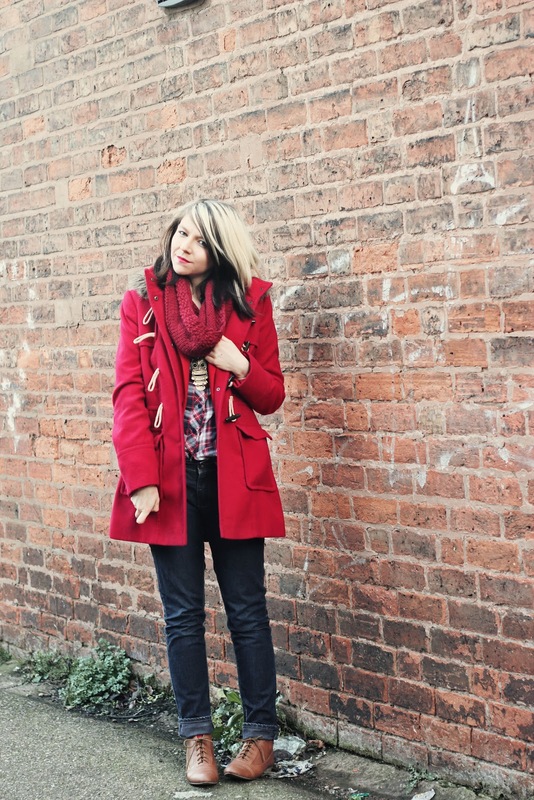 Really like how much red you've got going on, with the blazer, coat and snood. I absolutely LOVE your coat, and your whole outfit is so quintessentially collegiate even though everyone's left school and your there. I hope everything works out for your summer here, if your anywhere near NY we'll have to meet up! This is a wonderful outfit!! 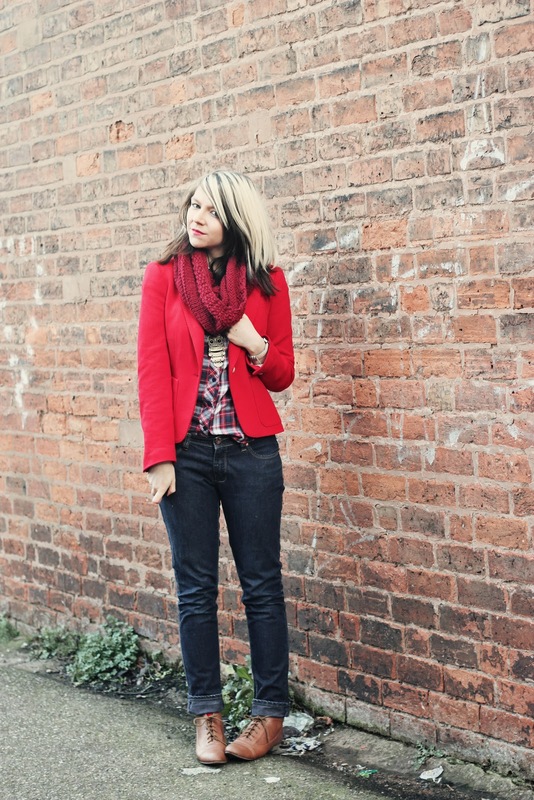 I love seeing bloggers a little more laid back looks. This is what I like to wear when I'm busy studying. I absolutely love that your mum knit you this snood, how sweet. 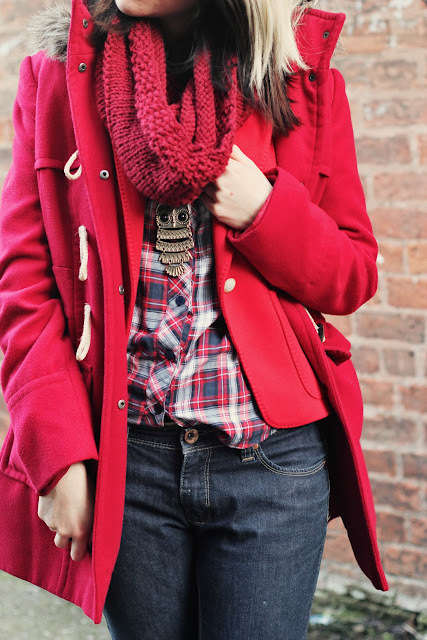 Love the plaid top and your red jacket! Our loafers with skull and bones are killers! Really love them!